A group of students, Thomas (Glenn Erland Tosterud), Johanna (Johanna Morck), and their cameraman Kalle (Tomas Alf Larsen), set out to make a documentary about a supposed bear poacher, Hans (Otto Jespersen). At the site of an illegally slain bear, they interview several local hunters, who comment that the bear tracks look odd and that someone probably dumped the carcass there, as well as Finn Haugen (Hans Morten Hansen), head of the Norwegian Wildlife Board. Finn dismisses the idea that the bear tracks could have been faked. The students manage to locate Hans, and follow him through Western Norway; when they try to interview him, he tells them to go away, but they persist. As they follow him into a forest, they see flashing lights and hear roars from something larger than a bear. Hans comes running back to his vehicle, screaming "Troll!" As they flee through the woods, Thomas is attacked and bitten by a large animal. They escape in Hans’ Land Rover, and discover their own vehicle turned over with the tires mysteriously missing. As they drive out of the woods, Hans admits that he does not hunt bears, but trolls. Though sceptical, the students ask if they can join Hans in his hunt and film it, and he agrees. The next day the students meet up with Hans, who asks if any of them believe in God or Jesus, as the trolls can detect the smell of a Christian's blood. They assure him that they are not, and they return to the same forest as the night before. Though the students begin to suspect that Hans is playing an elaborate prank on them, they are stunned when Hans successfully flushes out a giant three-headed troll, which chases after them. They return to Hans' Land Rover, where they see him use a large UV-lamp to turn the troll to stone. As Hans destroys the petrified troll, Finn arrives with a team of Polish bear trappers (Robert Stoltenberg) who deposit a bear carcass. Finn then plants fake tracks to keep up the ruse that bears are responsible for a string of mysterious deaths and mutilations of livestock in the area. Finn objects to Hans allowing the hunt to be filmed and angrily tells the students that they will not be allowed to keep their tapes. In a series of interviews Hans reveals that he and Finn actually work for the Troll Security Service (TSS), which hired him to help keep trolls a secret and to kill any that leave their territory and come near populated areas. He explains that there are a number of varieties of troll, and that the one he killed the previous night was a Tosserlad and therefore could not be the same one that bit Thomas and which Hans has been seeking, a Ringlefinch. The trolls are acting aggressively and have begun to leave their territories more often than usual, and Hans must get a blood sample from the Ringlefinch to try and help determine why. The students accompany Hans on another hunt and, using live goats on a bridge and the blood of a Christian man as bait, Hans successfully attains a blood sample from the Ringlefinch troll, before blowing it up with his UV-gun. Hans takes the blood to a veterinarian (Torunn Lodemel Stokkeland) who works for the TSS, but finds that it will take several days before any results can be found. Thomas interviews her and learns that the trolls’ adverse reaction to sunlight is due to their inability to convert Vitamin D into calcium, which causes their bodies to overreact. Hans and the students continue to search for the cause of the unusual troll movements, investigating a farm where a number of trees have been inexplicably uprooted, though the government tells the locals that a tornado is the cause. Hans and the film crew come back at night and enter the woods, where they find troll tracks leading into an abandoned mine. Despite protests from Kalle, they enter the mine and discover the lair of a pack of Mountain King trolls. The trolls return unexpectedly, trapping the group inside. Kalle, in a panic and sweating profusely, admits that he is a Christian. The trolls catch his scent and kill him, while the others escape with the now broken camera. Hans, Thomas, and Johanna return to Hans’ trailer to find Finn searching for the tapes. Finn demands that Hans head north to troll territory to get the problem under control. Hans agrees despite expressing fear of entering troll territory. He reveals to Thomas and Johanna that some years ago he was forced to massacre an entire troll population in that area, and does not like to go there. The group sets off with a new Muslim camera-woman (Urmila Berg-Domaas) and begins finding signs of a Jotnar, a giant mountain troll, 200 feet tall. Hans takes them deep inside troll territory, where Thomas begins to fall ill just as the Jotnar appears. A phone call from the veterinarian reveals that the blood from the Ringlefinch came back positive for rabies. It is likely that a rabies epidemic among the trolls is causing the unusual and aggressive behaviour, and that Thomas has been infected by the bite received several days earlier. Hans lures the troll away and attempts to kill it with the UV-lamp on his Land Rover, but the battery dies and the vehicle is destroyed. He directs the others how to find the highway before walking up to the engaged troll, delivering the finishing blow with his UV-gun and walking off into the sunrise. As the others hike out of troll territory, Finn and several government agents arrive to confiscate the students’ tapes. Thomas flees with the camera and is seen collapsing at the side of a road when the tape cuts out. Just before the cut to black a truck is seen stopping next to the camera, presumably the driver is the person who "found the footage". An epilogue tells the audience that none of the students were heard from again and directs viewers to contact the police with any information they might have regarding their fate. 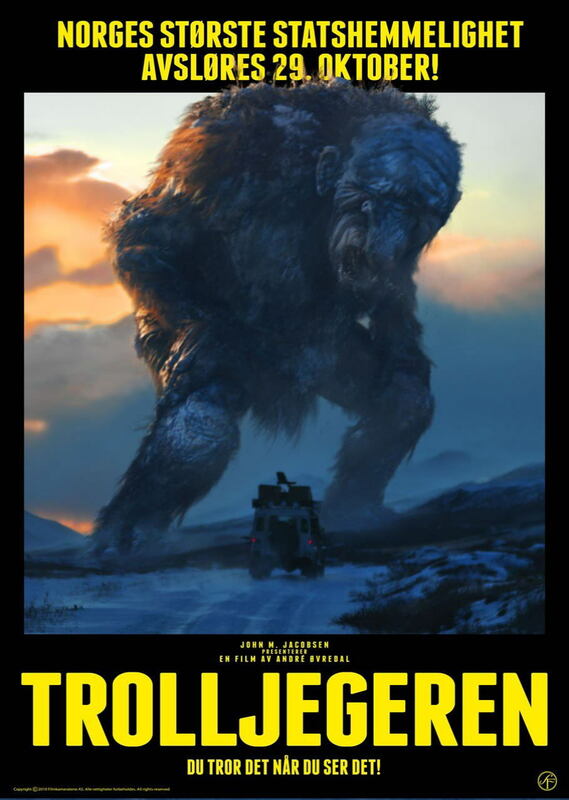 The film ends with a real news clip of the Norwegian Prime minister Jens Stoltenberg inadvertently admitting to the existence of trolls, though the press fails to take notice.